If you like birds, you are going to love this post! I have put a collection together of bird related home decor ideas and craft projects. Whether you are looking to make bird feeders, decorative bird houses or just want some inspiring ideas for your home, you will find it all right here. Starting with bird houses, is this purely decorative version in a rustic style. It was easy to make from just a birch log and an old rusty sign for the roof. 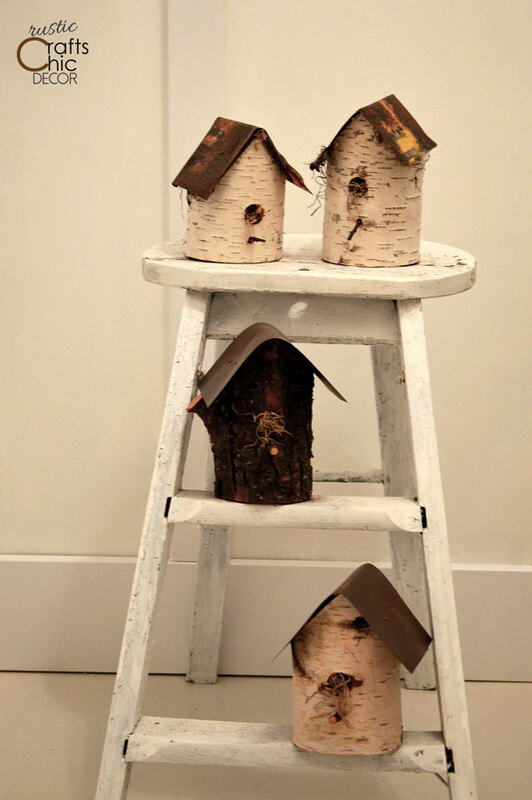 For more details on this project, go to Birch Craft: Make A Bird House. If you are looking for unique bird feeders to place in your yard or garden, you might be interested in crafting your own out of whatever junk materials you might find. My husband welded this one together out of some random salvaged metal. The birds love it and it brings us the rustic look, that we love, outside as well. 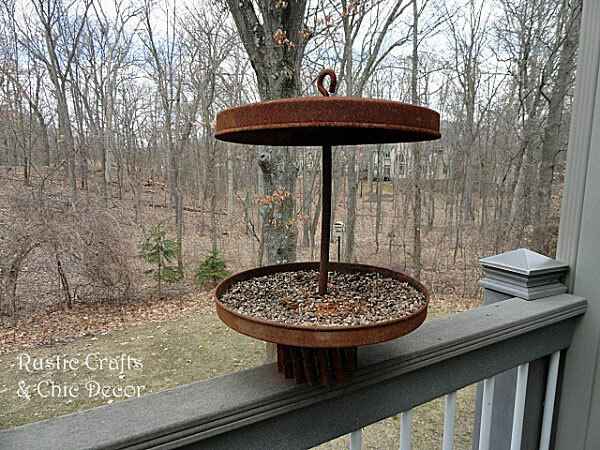 You can find more bird feeder ideas at my post DIY Bird Feeders. 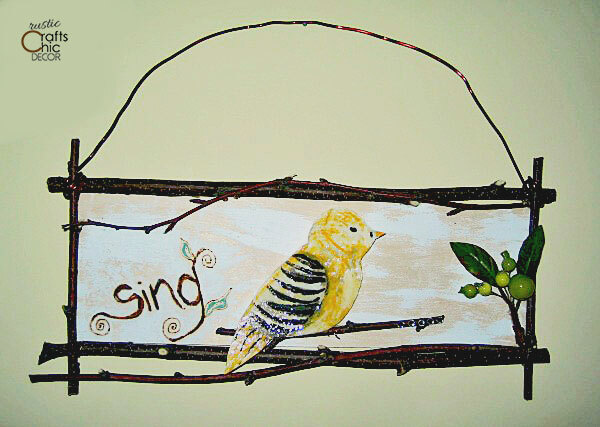 Easily create some inspirational art, incorporating birds, with a bird stamp, paint, twigs and typewriter keys. I used a stamp to get the basic image of the birds on the canvas and then added paint to get the coloring of the birds the way that I wanted. 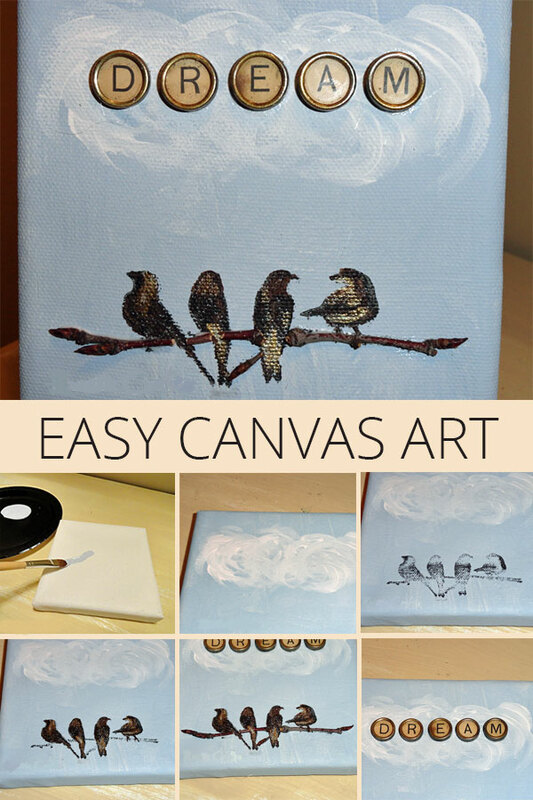 You can see the step by step tutorial at Painted Canvas Craft. Here is another fun way to bring in the bird motif. I used a variety of techniques and materials including wood burning, mod podge, paint, branches and floral picks. Check out all of the details at Design Your Own Wall Art. If you look around my house, you will see several different little bird figurines that I have picked up here and there. I just can’t resist a cute little bird to place on a stack of vintage books or on my desk. I even tried to create one, which turned out more like a little chick, but is a fun little addition with it’s rustic details. 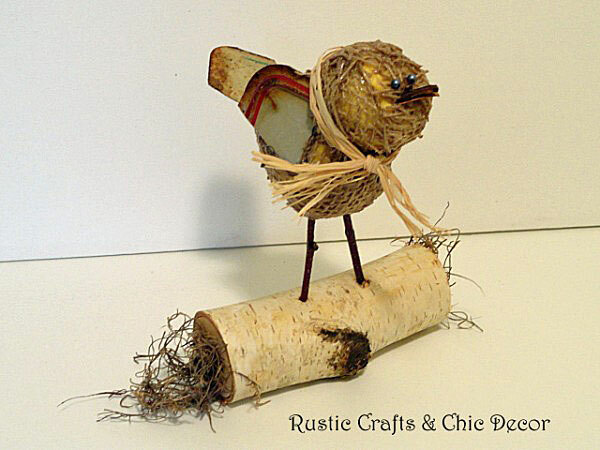 If you want to see how I made this little bird…or chick…see the instructions at Rustic Bird Craft. Do you collect buttons? If so, you may want to try this next project. I love the texture that buttons give to a design! To see more on this project go to Rustic Button Craft. For many more ideas on bird home decor and craft projects, make sure to check out my Pinterest Board, For The Birds.